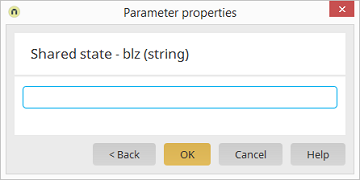 Applications module Button Web service request / Input tab / Context menu: Edit Parameter type / Select "Shared state"
The sharedState variable name can be entered here. This name should always begin with a lower-case letter. If it consists of more than one word, the first letter of each new word should start with a capital letter.